Our company is a result of a passion for horses and sports. I used to train several sporthorses in dressage for leisure. When the number of horses became substantial I quitted my job in the financial business and started Het Dressuurpaard (Dressage Horses). I already had several years of experience working in professional dressage stables where I developed a sixth sense for scouting good horses and for succesful combinations of riders and horses. Since a few years I expanded my business to China. 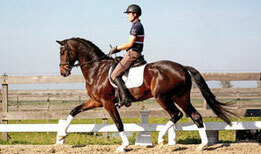 I do searching and export of sporthorses, coaching for Chinese sportriders and consulting for equestrian business.